Happy Father’s Day. 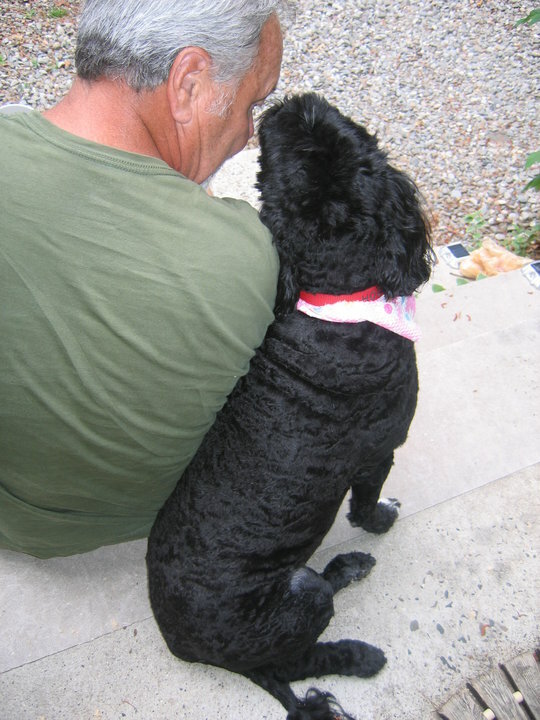 For this post, I present a warm and fuzzy father/son/dog story titled, “Grooming Conversation” that is one of the short stories found in SOMETHING’S LOST AND MUST BE FOUND (see ABOUT). It was inspired by a talk I had with a friend a few years ago. She told me that when she and her son talked while grooming the family dog, he was more open to conversation and always seemed to be more relaxed (and the dog was happier for it, too). I changed “her role” to that of a father’s, but the message is the same. Most people who understand the power of the paw know that a “Divine Reciprocity” exists between human and animal and manifests in even the most ordinary times often with extraordinary results that go way beyond words. Happy Father’s Day to my Dad and all the fathering figures of the world, who nurture our human and fur-children each and every day. Drip. Drop. A bathtub full of tepid water accepts a few strays from a leaky faucet. Sammy, a big Golden Retriever gently pants nearby, patiently awaiting a much-needed bath. Along with the plumbing, the poor dog’s grooming has been neglected. I make a mental note to fix that leak as I kneel next to Sammy, removing his worn leather collar and his red bandana thickly coated with long reddish strands. “Good boy,” I whisper rubbing the unfettered neck of the eight-year old family pet. Family pet? I think to myself. There was a time, not too long ago, when this duty of dog grooming was relegated to my son, Jake. After all, Sammy is technically his dog, a gift for Jake’s sixth birthday. Now at age fourteen, Jake doesn’t have too much time for Sammy, or me, for that matter. This thought gets me worked up. “Jake!” I call out the bathroom door. I wait a few moments and then call again. Lately I think I’d have a better chance of communicating with my son through a text message or an e-mail. “Jake,” I try again. “Would you mind helping me wash your dog?” I shout, motioning for him to remove the plugs from his ears. Jake reluctantly relinquishes his IPOD and cell phone, placing both on a laundry hamper in the corner of the room. Stripped of his electronic armor he looks vulnerable and awkward, alone in this quiet room with his father. Jake drops to his knees and joins me. He picks up Sammy’s brush and without much enthusiasm runs it over the dog’s back. Instead of reprimanding Jake for his lack of responsibility I remain quiet, fostering a glimmer of hope that I might have the opportunity for an actual conversation with my son. For good measure I visualize an imaginary harness placed around his chest, attached to a retractable leash. Sammy, responding to this unexpected attention from my son, dispenses two well-placed licks on Jake’s chin. For the first time Jake smiles. “I’m around,” Jake snaps, his smile vanishing. Easy, I coach myself. I let out some of the imaginary leash. From on top of the hamper Jake’s cell phone buzzes like a cicada on a hot June sidewalk. He stops brushing, staring at his phone as a text message is delivered. It takes all his strength not to pounce on it like a cat on a field mouse. Jake is examining Sammy’s left ear. “Okay, I guess,” the standard answer is dispatched, followed by a few seconds of dead silence as he examines the dog’s big head. Then something happens; Jake initiates a dialogue. “Remember the time that stupid Boxer bit Sammy right here? Look, you can still see the scar,” he says stroking the dog’s notched ear. “Yeah, I sure do. That dog ambushed poor Sammy,” I answer, carefully letting up on the leash a bit, allowing Jake to take the lead of our conversation. In his agitated state, Jake yanks hard with the brush at the fur on Sammy’s rump. Sammy lets out a small whimper. “Easy,” I say, calming Jake and comforting Sammy without interrupting the moment. “Well it is better than a D,” I say, making a small attempt at humor, pulling back on the virtual leash, drawing him a little closer to me. An increasingly impatient Sammy stands up and arches his back with a prolonged yawn. With my index finger I test the bath water’s temperature trying to buy some time. “I’m sorry to hear that. I hope that terrible war ends soon,” is all I can think to say. Sammy slumps to the floor with a sigh. Then he rolls over, soliciting a belly rub from Jake who quickly obliges. “You want to be an architect?” I ask, bringing the subject back to my son. I recall that just last month it was a Crime Scene Investigator. “Yeah, maybe we should get me a tutor,” Jake says, speaking to me over the dog’s underside. As if on cue, Sammy sits up as though he knows the water is ready for him. No more stalling. I know this moment will come to an end very shortly. I let out the leash to its full capacity as Jake’s cell phone hums again. “Thanks Dad,” Jake says. Smiling, he places a big kiss on the top of Sammy’s head. Then he spontaneously hugs me around the neck before snatching up his phone and IPOD, disappearing down the hall. “Let’s not let Sammy’s grooming go for so long next time, okay?” I call after him, but he is gone, reclaimed by the surprisingly complicated matters of his teen-age life. As the last of the bath water swooshes loudly down the drain I help the clumsy dog from the tub, savoring the words that still hang in the air. In the unlikely space of a bathroom I had briefly captured one of those rare head-to-head moments with my son; sitting around a crackling campfire, baiting a fish hook, soothing a bruised knee suffered during his first solo bike ride, and now grooming the family dog; each presenting an opportunity to communicate, to practice the lost art of conversation. War, bullies, cancer, career and a girlfriend. Who knows what concerns go through a kid’s head if we don’t ever get the opportunity to talk to them? With a large towel I dry the big dog giving him a full body hug. Then I speak to the clueless canine, “Thanks, Sammy. You were great!” Sammy regales me with an impromptu shower as he wildly shakes off the excess bath water. Sammy yanks again, harder. If I let him off-leash I know he will skip the playground and head straight to the red soil of a nearby baseball diamond, indulging in a luxurious dirt bath. Sammy whines in protest and a pleasant prospect pops into my head. Then I smile, anticipating just how filthy Sammy can get in that dirt and the inevitable grooming session it will bring about; another chance for a real conversation with my son over the haunches and under the belly of a wordless, but wonderful family friend. love the story and the photo! Happy Father’s Day. Thank you Sparrow. That was the first picture I ever uploaded on my facebook page. I love it too. Thanks for reading! Thank you RescueBoxer…glad to hear! « Junior Auxiliary Members of American Legion Unit 348 help the Pets of Vets.